Welcome to issue 92 of the AbiWord Weekly News. Continued work on new features and fixing of various Bugs. fjfranklin 151 Next generation plugin build system work, GNOME meta data tweaks, added two new UCS classes, autoconf tweaks, updated Swedish speller hash files, xml parser switch, aiksaurus autoconf cleanup, and fix unix language preference assumption (from Dom). dom 110 Mac build problems fixed, psion plugin tweak, sdw plugin tweak, meta data work including dialog for GNOME, abiword exporter fix, hancom plugin fix, some header cleanup, xsl-fo plugin fixes, some wv refactoring, xhmlt plugin fixes, and fixed FriBiDi includes. Fixed Bugs 3221, 3278, 3292, 3353, and 3362.
tomas_f 68 Pango stuff, fix obj directory naming, fribidi import, fixed xml typedef clash, fixed out of bounds write, and popt MSVC support. msevior 50 Refactored fl_Layout classes, fixed undo on page and column break, and fp_Container refactoring. plam 46 Cocoa: cursor blink, redraw/repaint work, and key input work. biesi 28 Hancom plugin work, sdw plugin work, sdw meta data work and documentation, and UT_Map tweaks. hub 12 Cocoa: break dialog. Also fixed Bug 3332 on trunk. phearbear 12 QNX: makefile tweaks, UCS updates, fixed Bug 3396, and compile fixes. uwog 10 Word Perfect plugin work, xml support tweaks due to libxml2 update. jeremyd 2 Win32 makefile tweak. frodo 1 Fixed Bug 3334.
rms 1 RPM spec tweaks: install OAF files, libxml2 requirements (from uwog). phma 1 Nynorsk update (from Karl Ove Hufthammer). 2321 248 Future [RFE] Maths/Equation Editing, as a plugin maybe? Commit: ABW imports metadata: Dom added support for meta data in the documents. MS Word and Star Office plugins have been updated to support import/export of these, and there's a new dialog for editing document meta data in AbiWord. There have also been several long threads on what types of meta data tags to use and how to localize these. See the mailing list archive for all the details if you are interested. Re: Hancom Office 2.01 for Linux (fwd): Alan Horkan decided to get in touch with Hancom after reading an interview with Bart Decrem about Hancom Office. Friendly folk, it seems, and happy to keep a communications channel open. Dom later posted a summary of stuff he'd discussed with Bart Decrem. First result of this will be the creation of a Hancom Office importer/exporter plugin, which Christian Biesinger started working on. commit: Stable: Backport bonobo stuff: Martin backported the bonobo support to the stable branch. That means AbiWord 1.0.2 on GNOME will be usable as a plugin from Evolution and Nautilus. 1.0.x STABLE RELEASE MAINTAINER: Hubert Figuiere and Mark Gilbert (aka MG, aka Blue Lizard) will be the stable release maintainers. Glowing review on MSNBC, Congrats! : MSNBC reviwed AbiWord. Nice one. We also know that Washington Post has one coming very soon. hey, evangelists! we're number two! : Second most popular project on SourceForge. Not bad at all! Fwd: Abiword manual and software translation to Portuguese: Wanderley M Ceschim offered to translate the AbiWord user documentation into Portuguese. We would love to see other volunteers to do translations for other languages - it would be an ideal way for users without programming abilities to help make AbiWord better. commit: Refactor the fl_Layout classes: Martin keeps working on the backend changes necessary for table support, among other things. Commit (Head): WordPerfect Exporter beginnings: Marc Maurer has started working on a Word Perfect exporter. Interesting. revision marks: Discussions on the design of revision marks started this week. Tomas seems to be driving the effort, with David providing valuable user-experience insight. Paul and Christian have also been sticking their heads into the fire. And late in the week, Tomas even committed a framework for parsing the discussed syntax for keeping track of revisions. A couple of weeks back, Hub and I reverted/updated the AbiWord BugZilla code to match that used by Mozilla. 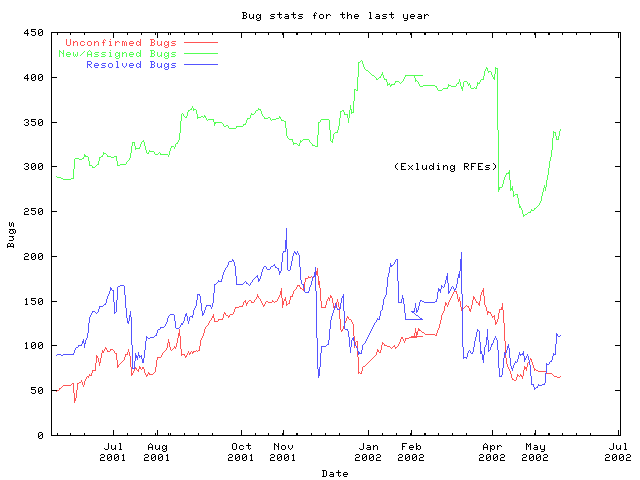 The primary reason for doing this was to make it easier to update BugZilla in the future. Since the AbiWord version of BugZilla had a different set of Bug states, people who were used to it may be a bit confused about the new Bug states. So here's a quick overview of a Bug's progress through the system, and who are responsible for getting the Bug there. UNCONFIRMED: This is a Bug's initial state, which it is created with when it is reported. The meaning should be obvious: only the reporter has experienced the problem, it has not been confirmed by anyone else. Everybody, developers and users, can create Bugs. NEW: When a Bug has been confirmed by a different person than the reporter, it should moved to this NEW state. The meaning is that here is a new Bug that has not been encountered before (this is an important point; if the Bug has been encountered before, it should instead be resolved as a duplicate). Everybody, users and developers, can move a Bug to the NEW state, assuming they are able to reproduce the problem and didn't report the Bug. ASSIGNED: A developer can claim a Bug by moving it to the ASSIGNED state. Only developers can move a Bug to this state. RESOLVED: When the developer belives the Bug has been fixed, it is moved to the RESOLVED state. Only developers can move a Bug to this state. VERIFIED: When a RESOLVED Bug has been verified as fixed by someone, preferrably the reporter or another user who was able to reproduce the problem earlier, it is moved to the VERIFIED state. Everybody, users and developers (but preferrably the reporter), can move a Bug to this state. This is the final state of a Bug - it means the problem has been verified fixed. REOPENED: If a RESOLVED Bug does not appear to have been fixed after all, the Bug is reopened. Everybody, developers and users, can reopen a Bug if they find that the problem reported in the Bug persists. CLOSED: This state should only be used for Bugs that should never have been filed originally, or for issues that are obsoleted (an example would be a problem with the old Windows installer, which has now been replaced with NSIS). Only developers should move a Bug to this state. There are other things that are good to know about the Bug database. Please see this link for more information. Finally, it's worth pointing out that keeping the Bug database tidy makes it simpler for the developers to keep track of where the problems are. Ideally, there should only ever be Bugs in the NEW state (waiting for developers to pick them for fixing) and in the VERIFIED state (after they have been fixed). Every user of AbiWord is able to help see to that the Bugs are only in those two states, and thus help reduce the amount of time developers need to spend on keeping the Bug database tidy.